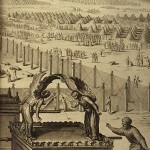 Constructing the Tabernacle and its furnishings was a major undertaking. It was also a great work of art. Commanded by God, supervised by B’tzalel and utilising the offerings of the people, it provided a physical meeting place and focus for worship. It was probably the first Jewish involvement in the arts. 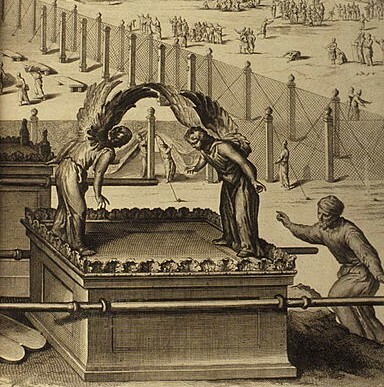 From the artistic point of view, one of the most remarkable features was the two cherubim who topped the Ark of the Covenant (Ex. 25:18). Traditional commentary offers a range of explanations as to what they looked like, but no-one can deny that they were an actual physical feature and not merely “virtual”, to use the modern term. Nonetheless, there have been countless attempts over the centuries to deny that Jews do, may and can participate in the visual arts. Solomon J Solomon insisted 100 years ago on the non-existence of Jewish art. Martin Buber said that the “Jew of antiquity” was “more of an aural than a visual man and felt more in terms of time than of space”. In the mid-20th century Hans Kohn argued that the Jew “does not see as clearly as he hears”. But this does not mean, notwithstanding the Second Commandment, that there was no visual art amongst Jews. The Megillah, for example, was often adorned by artistic illustrations. The Haggadah frequently became the object of artistic ingenuity. The appurtenances used in the Tabernacle, Temple and synagogue, and in the Jewish home, were also works of art. When the Torah says, “This is my God and I will adorn Him” (Ex. 15:2), the sages say, “Adorn His mitzvot – a beautiful sukkah, a beautiful lulav, etc.” (Shabbat 133b). Does this mean that Jewish art was limited to calligraphy and ritual objects? Chagall and Kitaj, and an array of other great Jewish artists, prove the opposite – not because they were artists who happened to be Jews, but because there is a Jewishness, however defined, evident in their art.